The Round Lake Area Exchange Club and sponsor, Consumers Credit Union, are proud to announce the October Hometown Hero, U.S. Army Sergeant Christopher Pirrello from Round Lake Park, currently residing in Bloomington. He was registered for this honor by his mother, Mary of Palatine. Pirrello graduated from Grayslake North High School in 2009, is a member of the Masonic Lodge in Grayslake and is attending Heartland Community College. 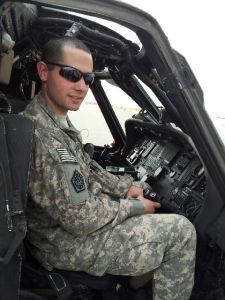 He has served in the Illinois National Guard for the last 7 years and has deployed to Kuwait. Pirrello is a Patient Administration Sergeant with the 108th Sustainment Brigade based out of the Chicago Kedzie Armory. He handles records keeping for patient information as well as ensure Line of Duty packets are submitted for review. Some of honors and awards he has received are: Army Commendation Medal, Army Achievement Medal, Army Reserve Components Achievement Medal (2), Global War on Terrorism Medals (Expeditionary and Service), Armed -Forces Reserve Medal (with M device), National Defense Service Medal, Lincoln Medal of Freedom, and Illinois Long and Honorable Service Medal. With the generous support of this month’s sponsor, Consumers Credit Union, Pirrello’s “Hanging with the Heroes” care package will include a gift card, a personalized “Hanging with the Heroes” t-shirt (donated by Artrageous of Hainesville) and letters from Round Lake School District 116 students. The Hometown Hero website is managed by Fokoz Creative Group of Grayslake. The Round Lake Area Exchange Club will present a plaque on his behalf Wednesday, October 28, at their meeting in Round Lake.